It’s important to keep you child well-hydrated at all times, especially during these extra warm Arizona days! However, not every beverage is equal when it comes to children’s dental health. Sugars, acids and more can make some beverages risky for your child to consume. Below are some great tips to help you understand whether the drinks your child is consuming is hurting their teeth. Most parents would be stunned to learn how much sugar is in a regular soda! For instance, did you know that a 12-ounce can of regular Coke contains 39 grams of total sugar, which is about 9 1/3 teaspoons of sugar?! You can see why this sugary beverage is not a good choice in keeping your child’s teeth healthy. Unfortunately, regular sodas aren’t the only beverages that are not healthy for your child. Diet sodas can be harsh on your child’s tooth enamel as well. Why? The acid content in all sodas, regular and diet, can eat away at the enamel that protects your child’s teeth. So, try to avoid regular soda consumption by your child to keep their tooth enamel protected. If you do give your child a small soda to consume, don’t allow them to sip continuously over several hours. Even one bottle of soda, if sipped over hours, can do extensive, irreversible damage to tooth enamel. The problem with many sports drinks is that they share the same problems as sodas when it comes to kid’s teeth. Many contain a huge amount of sugar, and the fizzy drinks have that same erosive effect as soft drinks. Add on top of that the harsh food coloring that many sports drinks contain, and they make for one of the worst beverages for a child to consume. It’s better to simply avoid them altogether. If you want to give your child a small drink as a treat, stick to the low sugar, non-carbonated drinks that don’t contain harsh dyes. If the beverage is brightly colored or neon, best skip it. Fruit juice can be healthy if you choose the right one for your child, and limit how it’s consumed. Even natural, unsweetened fruit juices have sugars in them which can make them harmful for your child’s teeth. Fruit juices, like sodas, also can be highly acidic! Of course, natural fruit juice is a great, nutritional drink for your child, so to keep your child’s teeth healthy, stick with natural, unsweetened juices or dilute the juice with half water to reduce that sugar and acid. 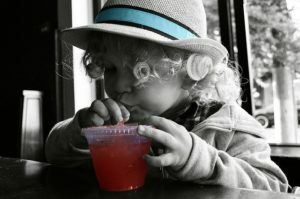 For parents whose children are still using sippy cups, limit the amount of time they have to consume the juice as long-term exposure to fruit juices can cause enamel issues over time. Does this mean my child should only drink water? With all the warnings about sodas, sports drinks and even juices, parents might walk away thinking water is the only healthy option, but there ARE other options for your child to enjoy! Milk is actually a great alternative for a beverage. Studies show that milk and dairy products such as cheeses can actually reduce tooth decay. Not only does it contain calcium and phosphorus, but also proteins called caseins, which form a protective film on the enamel. Of course, water is always a fabulous choice as a drink! There are zero sugars in water, and unless you buy the carbonated type of water, no fizzy carbonation that can impact tooth enamel. What’s even better, water can wash away some of the harmful bacteria that can cause tooth decay. A win-win all the way around! In general, when you’re choosing drinks for your child, avoid sugary, fizzy, highly dyed beverages for their regular consumption. If they get a sugary drink as a treat, make it a small portion, and don’t let them consume it over several hours. Here’s to a healthy smile!